I had a dream when I first joined opposition politics way back in 2001, a Democratic Dream. No matter where I venture politically, this Dream has never left me. Democracy is a very large word indeed and many have different views on what Democracy really is. Checks and balances are important aspects in a Democracy but most as it seems, only stop at the parliamentary level. Many of the problems with the policies we face right now are partly, or wholly, due to the lack of necessary Democratic system in the governance of our country. From the deliberate inflation of HDB prices, the signing of Free Trade Agreement which affect Singaporeans to the unchecked opening of floodgate to excessive foreign labour, all these done with absolutely no systematic and analytical checks nor consultation. I believe Real Democracy is built upon a good system of governance which institutionalizes the necessary Separation of Powers within the establishment. It is not just only about having more opposition MPs in parliament but devising a system that would prevent the over concentration of powers into the hands of a few ruling elites. 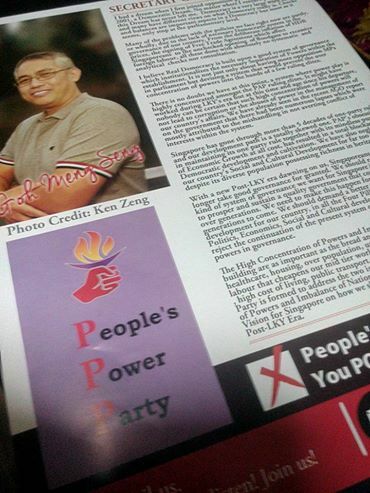 There is no doubt we have at this point, a system where power play is highly concentrated amongst the PAP ruling elites. It might have worked during LKY’s era but at this time and age since his departure, nobody can be certain that such high concentration of powers will not lead to corruption or the abuses of power in the management of our country’s affairs. We have already seen in the recent AGO report on the government that there had been numerous lapses which were mostly attributed to the mishandling in not averting conflict of interests within the system. Singapore has gone through more than 5 decades of one-party rule and our development path is a totally skewed one. PAP’s obsession in maintaining its one party rule together with its mindless pursuit of Economic Growth at all cost, has resulted in a total blockage of Democratic development and cultivation. We have also neglected our country’s Social and Cultural Development for far too long, despite its diverse population possessing richness in heritage. With a new Post-LKY era dawning on us, Singaporeans should no longer take good governance for granted. We should rethink on what kind of system of governance we want for Singapore in order for us to prosper and sustain a quality government that could be inherited over generations. We need to make this happen for our future generations to come. We should demand a better and balanced development for our country, in all the Four Pillars of our Nation; Politics, Economics, Social and Cultural development. We should reject the continuation of the present system of high concentration of powers in governance. The High Concentration of Powers and Imbalance of Nation building are as important as the bread and butter issues like healthcare, housing, over population, unchecked influx of foreign labour that cheapens our mid tier work force, Free Trade Agreement, high cost of living, public transport, CPF, etc. The People’s Power Party is formed to address the two issues of the High Concentration of Powers and Imbalance of Nation Development. We will provide a Vision for Singapore on how we should strive and prosper in this Post-LKY Era.